Virtually everyone in Alaska is touched by a nonprofit - we are part of the community and the economy. Alaska’s nonprofit sector represents a variety of organizations that provide public service and have an impact on the lives of nearly everyone living in the state. 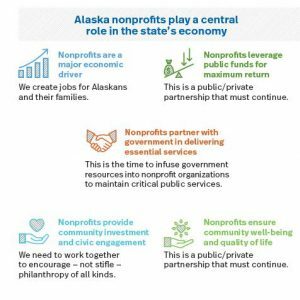 Although most Alaskans do not think of nonprofits as an economic powerhouse, we play a critical role in the state’s economy both as major employers and as revenue generators. No industry in Alaska can prosper without the nonprofit sector. We provide both a financial and social return on investment by leveraging public and private resources. We are part of the healthcare, utilities, fisheries, and oil and gas industries, and provide essential services such as firefighting, early child care, basic utilities, housing, and food security — just to name a few. To that end, we are excited to present the latest research on the economic impact of Alaska’s nonprofit sector. In this report, we highlight five ways that show how we’re doing our part to meet the challenges of the state’s economy. In 2015, nonprofits accounted for 17% of all employment in Alaska compared to 10% nationwide. The sector directly employed 44,092 Alaskans. 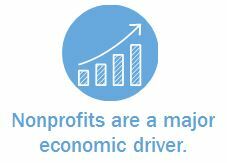 Counting indirect and induced effects, nonprofits were responsible for sustaining 66,700 jobs in the state. These jobs translate into $3.8 billion in total generated income that ripples through our communities. Nonprofits are doing their best to carry out their critical role in the community. Their use of earned income, private philanthropy, and limited public resources is judicious. 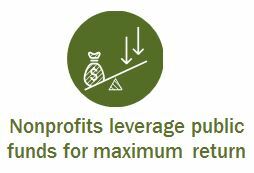 Every day nonprofits work to maximize and leverage each resource. Federal, state, local, and tribal governments often contract with nonprofits to perform key responsibilities efficiently and effectively. 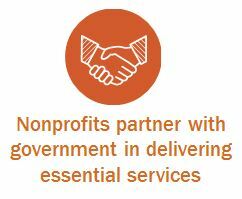 This is the time to infuse government resources into nonprofit organizations to maintain critical public services. 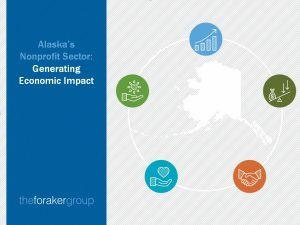 The economic engine of philanthropy coupled with Alaska’s high rate of volunteerism has a powerful influence on programs, infrastructure, education, and jobs across Alaska. To increase civic engagement and private investment, we need to work together to encourage — not stifle —philanthropy of all kinds. Prosperous economies and healthy communities create a rich quality of life. 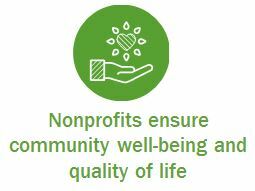 As a partner to local governments and industry, Alaska nonprofits provide essential services and bring us joy and purpose through art, religious and cultural expression, education, and recreation. This year we have written this report specifically for policy makers. We hope you will share this information with the people in your community who are making decisions about government funding and policies that may have an impact on the sector. We’ve provided a brief summary of the report to aid you in your conversations.